Sullivan & Cromwell advises bank clients around the world on a wide variety of important regulatory matters. The Firm deals on a regular basis, and at all levels, with securities, commodities, banking and other regulatory and governmental agencies. 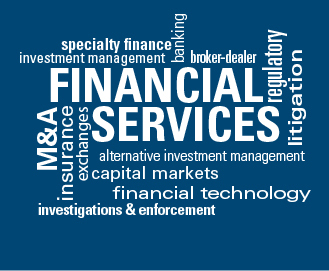 S&C has extensive experience with U.S. and non-U.S. financial services laws and regulations, as well as with the agencies that apply them. The Firm regularly deals with the Federal Reserve, the Treasury Department, the Office of Comptroller of the Currency, the Federal Deposit Insurance Corporation, the Consumer Financial Protection Bureau, the Financial Crimes Enforcement Network, the Office of Foreign Assets Control and other U.S. federal agencies involved with financial services, as well as with the various state banking agencies. The Firm also works with bank clients to develop strategies for their interactions with Congress and other legislative bodies or in drafting legislation. S&C currently provides extensive advice to market participants on the Dodd-Frank Wall Street Reform and Consumer Protection Act and the Volcker Rule. No law firm has a more thorough understanding of the legislation and its implications than S&C. This advice covers a broad range of issues that are fundamental to the core strategies of the Firm's clients. In 2011, the firm launched an online Dodd-Frank database to help users stay informed about regulatory updates in a rapidly evolving area. The Clearing House, an association of major banks, on various matters, including pending legislation and regulations relevant to the banking industry. China Merchants Bank, Banco Espírito Santo de Investimento, the Bank of Ireland and a number of other major non-U.S. banks, in connection with the establishment of operations in the United States. large U.S. and non-U.S. banking organizations, on Federal Reserve matters. For example, the Firm is engaged with a number of clients with respect to structure reporting requirements—the new rules under Section 165 of the Dodd-Frank Wall Street Reform and Consumer Protection Act, the Volcker Rule. major U.S. and non-U.S. financial institutions regarding compliance with various regulations, including the affiliate transaction rules under sections 23A and 23B of the Federal Reserve Act; restrictions on insider transactions (Regulation O); reserve requirements (Regulation D); restrictions on management interlocks (Regulation L); and lending, investment and activities limitations (Regulations K and Y). non-U.S. and U.S. banking institutions, in connection with structuring private investments in funds and other nonbanking companies. American Express, in its acquisition of Loyalty Partners, which is now a subsidiary of American Express and part of the company’s International Consumer and Small Business Services Group.